The Summer of Love and Monterey Pop aren’t the only anniversaries San Francisco is celebrating. Last night a standing-room-only crowd at the California Historical Society had the rare treat of watching John and Grace De Soto Ferry’s 2015 film Taking Alcatraz, followed by some riveting personal recollections from the filmmakers and the participants. Around 50 years ago, as Adam Fortunate Eagle tells it onscreen, the Bay Area’s diverse Native Americans yearned for a stronger sense of heritage than they and their children were getting from assimilation. Spurred partly by the Civil Rights movement, partly by the U.S. government’s neglect of its treaty obligations, they started working more and more collectively. 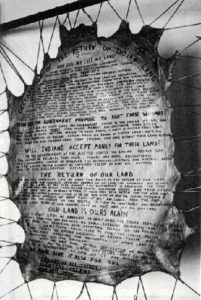 When a local Indian center was destroyed by fire, and the feds declared Alcatraz Island and its abandoned prison to be surplus property, they remembered the Treaty of Fort Laramie (1868) between the U.S. and the Sioux. That treaty returned to Native peoples all retired, abandoned and out-of use federal lands. 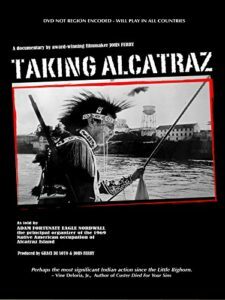 On November 20, 1969, 79 Native Americans began a 19-month occupation of Alcatraz. They wound up living mainly in the guards’ quarters, after water and electricity were cut off to the other buildings. Creedence Clearwater Revival donated a boat; individuals and restaurants donated food. Dr. Larry Brilliant, who offered medical assistance, delivered a baby for John and Lou Trudell when Lou insisted their child be born on liberated Native American land. Herb Caen used his popular column in the Chronicle to keep San Franciscans informed. When he polled support for the occupation vs. the Coast Guard’s persistent attempts to end it, the occupiers won 80 to 20. The government’s antagonistic response seems to have been softened by Vietnam-beleaguered President Richard Nixon. He halted the objectionable federal policy of removing (by carrot and/or stick) Indians from their reservations to eight designated cities, and met enough of the occupiers’ other terms that they agreed to leave the island. Although some accounts state that they were forcibly removed, participant Sacheen Littlefeather and other speakers at the June 15 joint presentation by CHS and New Museum Los Gatos saw it differently. They accepted a swap: Alcatraz (which suddenly was no longer surplus, but a major potential tourist attraction) for 200 acres of land near Davis, CA. There the Native Americans created Deganawidah–Quetzalcoatl University (DQU), a two-year college from which students could go on to complete a four-year degree at UC Davis. More on this historic turning point coming soon in Part 2.